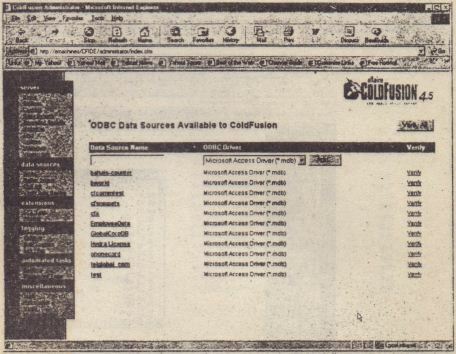 The true power behind ColdFusion is its capability to access and manipulate database records. In this chapter learn how to access a database using ColdFusion and basic Structured Querv Language (SQU k1 retrieve information from a database.You will be working with a Microsoft Access 97 database provided on the CD that comes with this book. It is not essential that you have Access 97 in order to continue but it would be very useful. 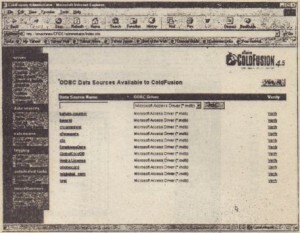 Before ColdFusion can interact with a database, you must set up a ColdFusion data source in the ColdFusion Administrator. You will have to set up a Cold Fusion data source only once for each database you need to work with. 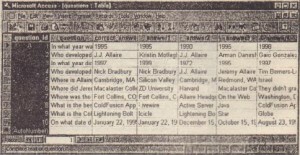 A data source is essentially a pointer to the physical database. In a sense, it is the source path for the data you want to access. 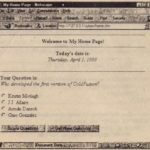 You will be working with the ColdFusion Administrator to set up the data source. 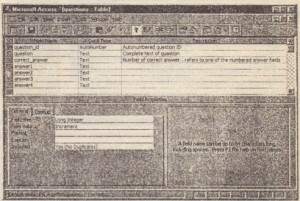 In this example each question and all the information tied to it is called a row or a record. 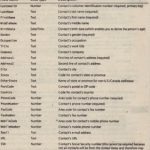 Each question in this table has its own correct_answer answer and so on. So 10 questions would constitute 10 rows, or records, in our quiz database. 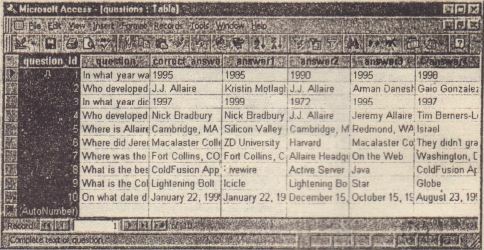 In Figure 3.4 you can see that the second record has been highlighted. A field that you did not use in the previous chapter has been added to the quest; om table. This field question_; d is the primary key field (see Figure 3.3). A primary key is. 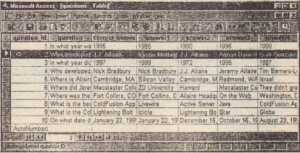 field (or combination of fields) that enables a record to be uniquely identified. Normal a numeric value is used for the primary key. 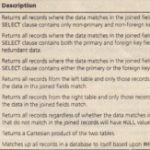 No single record in a table can have the same primary key value as any other record. 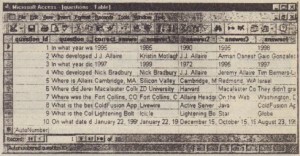 In this way you can easily distinguish, search, and identify records. You will be using the primary key value later-in this chapter to identify questions when you access the database . Microsoft Access also enables you to view and modify the design of a table. Select View >- Design View or look at Figure 3.5. This is where all the fields are defined. You will notice that the question_ id field (the’primary key) is an auto number field. Auto number means that each time a new question is added to this database table the value for this quest; 0″_id field is automatically generated by Access In this way Access ensures that no two values in this field are the same. You can also see the data types for the other fields. If you are using Access to view this table, please be careful about making any modifications at this time. Modifications to the table could affect the operation of the code you will write in the rest of the chapter. Of course, if you do make modifications and have difficulties, you car. 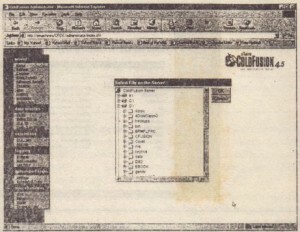 always copy a fresh version of the database to your hard drive from the accompanying CD. You will be asked for the administrator password. This is the password that you specified during the installation of Cold fusion. When the administrator loads, please select the ODBC link under Data Sources on the left side (see Figure 3.6). This is the screen where you will add data sources for Open Database Connectivity (ODBC) databases. ODBC is a standard protocol used with many databases to allow for outside access (such as importing and exporting data). 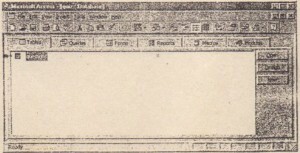 Microsoft Access is a database that has an ODBC driver. First you need to name your data source. It does not have to have the same name as the database file, although this sometimes helps in remembering what database you are referencing. 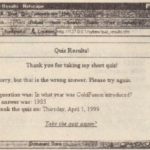 In the Data Source Name field, type quiz. 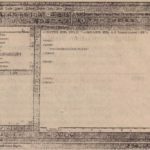 The default ODBC driver selected should be Microsoft Access Driver. If it is not, please select it. 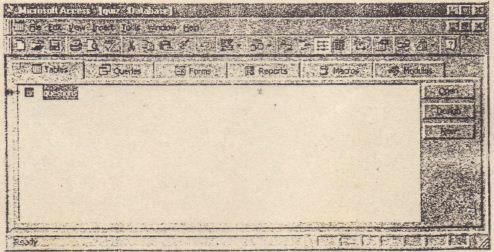 Then select Add (see Figure 3.6). 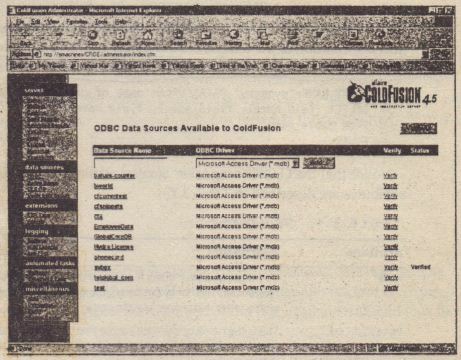 Now you are on the Create ODBC Data Source screen (see Figure 3.7). The data source name is already specified. You do not need to enter a description, but you may if you like. Now you need to specify the path where your qui z. mdb file is located. When you do this, ColdFusion will know where to go when accessing this database. Because the path will vary depending on your Web server root directory, select the Browse Server button . 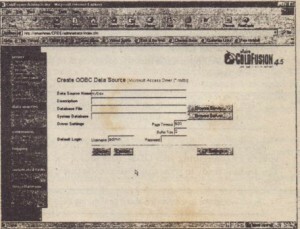 Finally, on the Create ODBC Data Source screen, select Create. 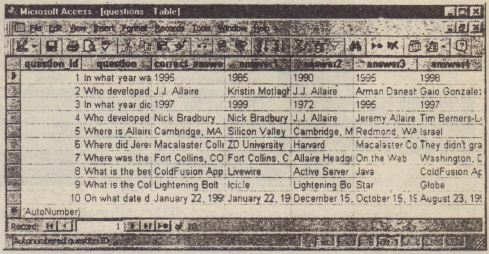 You will then see the quiz data source listed, along with the example data sources provided by Allaire. 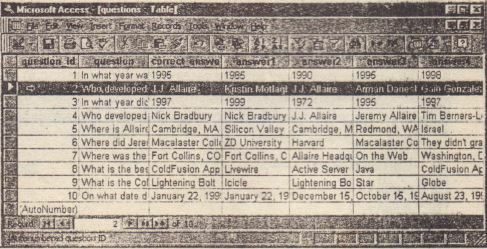 To the far right of the screen, under the Verify column, the word verified should appear (see Figure 3.9). This means that the connection to the data source has been successfully established.